In crowded town halls around the country, congressional Republicans had many eye-opening encounters this past week with Americans who voiced fear and anger over the prospect that they will lose their health insurance if the Affordable Care Act is repealed. The lawmakers struggled to answer people's questions about what they will offer as a replacement. The big question is whether the searing experience will prompt GOP lawmakers to rethink their plans to repeal and replace the healthcare law, or whether they will dismiss the protests as a partisan whining from Democrats who haven't gotten over losing the 2016 presidential election. One clear lesson from the town hall events, said both Republican and Democratic observers, is that President Donald Trump and congressional Republicans need to quickly coalesce around a solid ACA replacement plan they can convincingly sell to the public. Still, some of the lawmakers, along with Trump himself, cast doubt on whether the pro-ACA speakers at the town hall events were truly local constituents or whether they were there as part of outside organizing efforts. "The so-called angry crowds in home districts of some Republicans are actually, in numerous cases, planned out by liberal activists. Sad!" Trump tweeted. But others, like Sen. Bill Cassidy of Louisiana, accepted that the often-critical town hall participants were genuine local folks. There were more than 30 congressional Republican town hall meetings in the last week, according to the Town Hall Project site, a site that tracks these events and other public appearances by lawmakers each week. 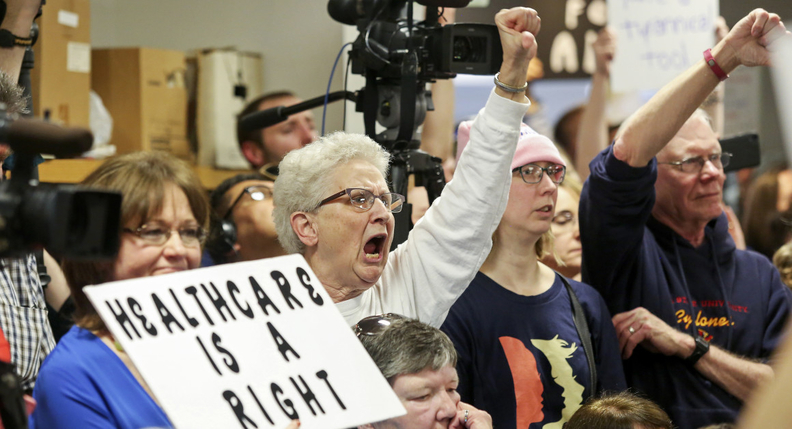 Many of the events featured testy exchanges, tartly worded protest signs, booing and jeering, tears, and pleas to preserve the ACA's coverage expansions, under which more than 20 million uninsured people got insurance. When asked by questioners to describe what they would substitute for Obamacare, some lawmakers admitted they didn't have anything concrete to offer yet. Beyond the town hall events, GOP lawmakers were faced with new polls showing diminishing public support for repealing the law, particularly without a good replacement. But it's not at all clear that Republicans will be deterred from moving forward next week with their plans to quickly repeal most of the ACA through expedited budget reconciliation legislation that can be passed on a straight party-line vote. One major factor will be how the nonpartisan Congressional Budget Office scores the bill in terms of its impact on uninsured rates and budget costs. The other question mark is the impact of the town halls. One reason to think congressional Republicans won't back off is that their legislative timetable requires repealing the ACA before they can move on to their high-priority goal of passing tax reform, providing tax cuts for businesses and wealthy people, said Dave Dulio, a political science professor at Oakland University in Michigan. Matthew Cox, a Republican and owner of the public relations firm, Capitol Partners, said the GOP's messaging around the need to repeal and replace needs improvement. Republicans have focused too much on the ACA's unpopular individual mandate, rising premiums and limited plan options, and not enough on whether people with preexisting medical conditions will continue to be able to find and keep insurance. Indeed, there were many emotional personal stories and questions at the town halls on the pre-existing condition issue. “For families like mine with a disabled child, that's most important and we need to be able to plan for what's coming,” Cox said. But some Republicans argue lawmakers should ignore much of the town hall input because it was professionally organized – even though there were well-funded conservative organizations organizing many of the conservative Tea Party town hall protests against Democratic healthcare reform legislation in 2009. Some experts warn Republicans not to ignore the public sentiments they heard at the town halls, or else they may face the same political slaughter Democrats did in the 2010 elections following passage of the Affordable Care Act, Dulio said. Former Democratic Rep. Henry Waxman, chairman of Waxman Strategies and a key author of the ACA, said the political fallout could be even worse for Republicans in the 2018 elections than it was for Democrats in 2010 if they don't move aggressively to address public concerns about their repeal-and-replace efforts.